This photo of young Stonewall resistors, one of the few known pictures from the first night of the rebellion, is credited to Joseph Ambrosini in the New York Daily News on Sunday, June 29, 1969. Several years ago, historian Jonathan Ned Katz found the name Joseph Ambrosini in the New York City telephone book, called, and spoke to a relative of the deceased news photographer. Asked what happened to a lifetime's collection of negatives and prints, the relative said the photographer had dumped his whole archive in the garbage, imagining that it was worthless. The story in the Daily News, night owl edition, page 30, is headlined: "3 Cops Hurt As Bar Raid Riles Crowd." 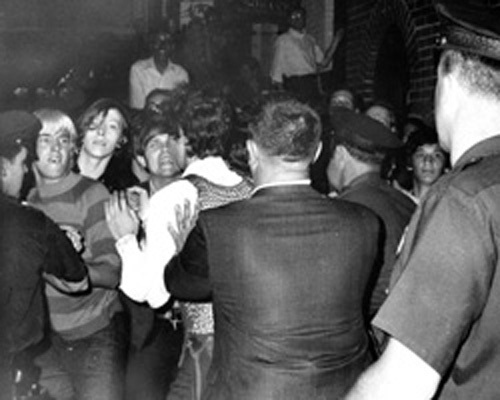 The caption under the picture says: "Crowd attempts to impede police arrests outside the Stonewall Inn, Christopher Street." Police have been keeping an eye on the Stonewall Inn at 55 Christopher St. for some time. They had been told to explore the possibility of 'local syndicate involvements.' Last week, they raided the Greenwich Village place, tabbed a homosexual handout and said they gathered evidence of illegal sale of alcohol. That raid went off without a hitch. At 2 a.m. yesterday, in a second raid, the picture was different. At least three policemen suffered minor injuries from an irate crowd, the front of the place was set afire and 13 persons were arrested. Peace was restored about 4 a.m.